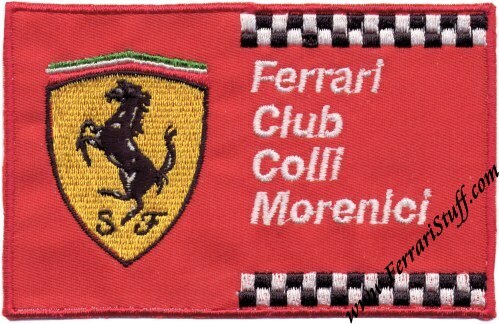 Ferrari Club Colli Morenici Sew-On Patch. This is the official patch of the Colli Morenici Ferrari club which is located near the Lago di Garda (Garda Lake) in Northern Italy. It measures some 10.5 x 6.5 cm or 4 x 2.5 inches. Would give your Ferrari outfit that international touch but would look equally good as a decoration item in your model car display!